Monthly Baby Pictures - C.R.A.F.T. Mila is one! She is actually almost 14 months, but mama is a little behind, as per usual. I love how her monthly baby pictures turned out! It was simple, easy, and only required a Sharpie marker, a roll of white paper, and a little patience. Oh and all of the pictures were taken on my iphone. You don’t need a fancy camera! If you are new here, here’s Mila’s gender reveal party, natural birth story, and Max and Mila’s shared nursery! How sweet are all of the monthly pictures together? Psst… there are affiliate links in this post. 1. You’ll need a few supplies: A roll of white paper, a Sharpie marker, and your phone camera. Make sure that the roll of white paper is wide enough. The width of the paper needs to be at least 30 inches to ensure that baby has enough room to wiggle and there is still white space around her. Here’s a perfect roll of white paper from Amazon. I used a black Sharpie marker to write the months. Oh and I use my iPhone 6s camera, but seriously any phone camera will work! 2. Write the months yourself: Your handwriting is the best! I promise. It makes it more personal and special. I swear you can make anyones handwriting looks good by thickening up the lines with a Sharpie! If you super hate your handwriting you could consider using a stencil, but that takes longer and who has time for that when caring for tiny humans. 3. Keep at least 4 inches of white space above the words and a few inches of white space on all edges. 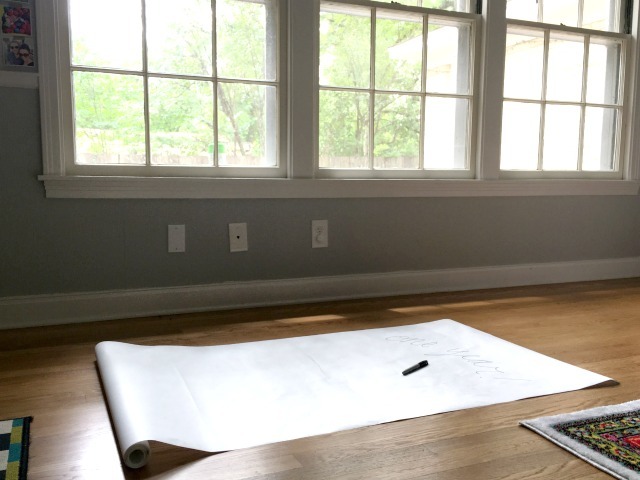 You’ll need this space for wiggle room when editing. Here is an unedited eight month picture. I had to rotate the picture to make sure the wood floor wasn’t showing and the white space made the edit possible. 4. Turn the grid on on your camera: I like to line the top line of the grid up with the top of the paper. You might only have a few seconds to get a good picture, so you gotta be on top of things! To turn on the grid on on your iPhone, go to the Settings app, scroll down to Photos & Camera, and make sure the Grid option is turned on. 5. Burst mode is your friend: Burst mode allows you to take 10 pictures in one second! This is golden in the world of wiggly, unpredictable babies! To use burst mode, hold down the shutter button for half a second or longer, and the iPhone will start taking photos one after another. I try to get at least 3 good burst shots per photo session. I’m not lying when I tell you these monthly photo sessions take about 4 minutes! 7. Keep the shoot to 5 minutes or less: With Mila, I would get the roll of white paper out and do cursive writing while she was asleep. That way when she woke up, I could change her diaper, change her into her picture outfit and do the quick shoot! 8. 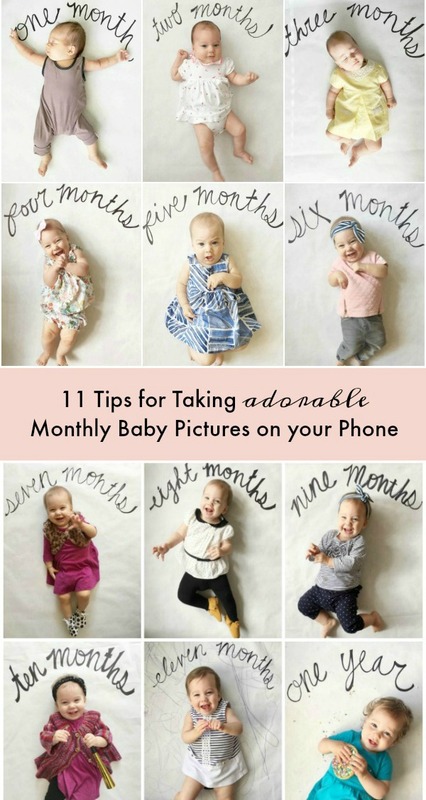 Don’t be scared of props: As your baby gets older, the monthly photo gets harder! Mila has something in her hands in month 10- onw year. 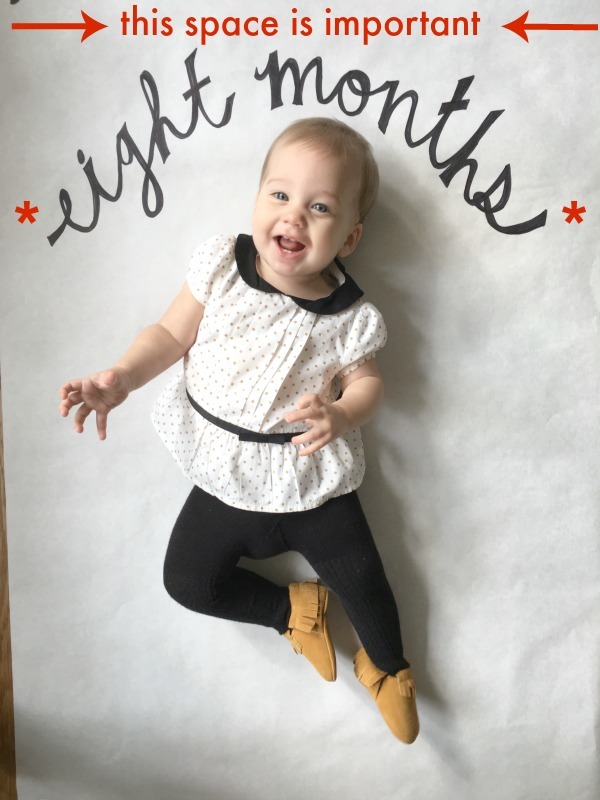 Consider using props that represent the month, like the New Years Eve noise maker for Mila’s 10 month picture. Crayons and board books are always a winner. And the cookie for her one year shoot was realyl fun! To be honest, she hated the cookie, but liked holding it! For Maxwell’s monthly photoshoot I let him hold a toothbrush, blocks, and even a tambourine! 10. Be Flexible: If siblings want to participate, let them! If someone wants to color all over the white roll, who cares! Don’t stress yourself out, just let it happen. Oh and if you’re a few days or weeks late, don’t fret. The 11 month photo shoot started off on a terrible note, but ended up being one of my favorites! 11. Edit: I always edit a few of my favorites from a monthly photo session. I edit the picture right on my phone with an app called Afterlight. But, you can certainly just use the iPhone’s editing tools too. 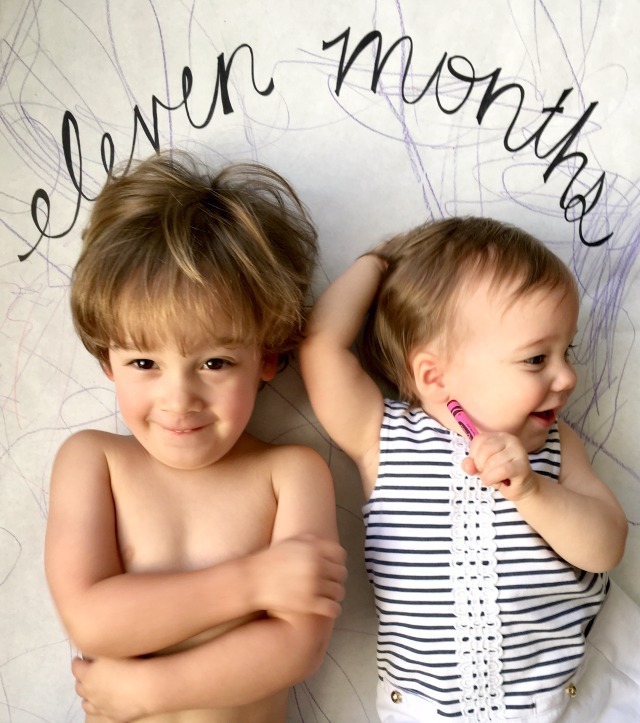 Typically, you’ll need to rotate the image to make the “eleven months” be in the center and possibly brighten, highlight, or up the contrast to make the picture look its best! I did a monthly baby photoshoot with Maxwell too. For his pictures, I used wooden blocks and blankets, quilts, and rugs from around our house! Another fun idea, I made some cute gender neutral monthly milestone stickers that you can print for free! Did you do a monthly photo shoot with your baby? I’d love to hear? Nice idea! Do you think a 2 ft wide paper will work just fine? Thanks for sharing, he is ADORABLE!! !